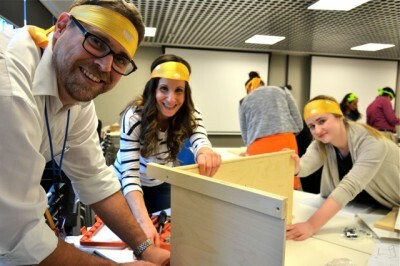 Here are 10 of the best Charity Team Building Activities that are amazing for staff training and employee engagement. Engage, inter-connect staff and employees personal development and group training more. By investing in professionally facilitated CSR Charity Team Building Activities. 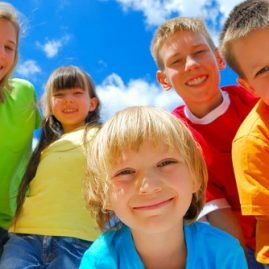 Thrill specialises in connecting businesses and corporate groups with deserving Australian kids and family focused charities. Thereby creating a greater connection between your staff, employees, managers and leaders whilst demonstrating care for disadvantaged people in our communities. Utilise staff team training exercises or team building budgets to participate in meaningful, quality Charity building projects that make a difference. Professionally facilitated with rewarding outcomes for both your staff, the selected charities and their recipients in a Win-Win-Win scenario. “Thrill facilitates corporate socially responsible CSR teamwork projects that make a magical positive impact by rewarding your staff engagement”. Thrill commenced facilitating philanthropic charity team building activities and events 24 years ago. 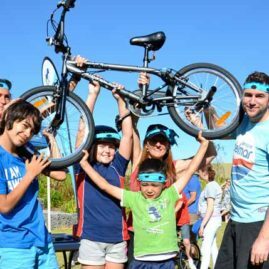 By building and donating new kids bikes to several Children’s Charities in Sydney and throughout the east coast of Australia. Simply because Thrill is about experiences that support the development of children to develop further independence in a caring environment. Helping people who are disadvantaged in our communities. This stemmed from staff being a child in a disadvantaged Sydney community with no funds. Since then Thrill has developed 14 activities where your team development builds items for selected charities. Strengthen your staff bonds, improve communication, team efficiency and inter-connectivity between employees. Tremendous feedback from Thrill’s corporate clients, businesses, local communities and charity partners was received. From this humble beginning. We embarked on developing a worthy range of exciting, hands on CSR team building programs for businesses, corporations, staff and employees. Professionally hosted, fun, facilitated and delivering fun CSR (corporate socially responsible) charity events. Where companies, their staff and employees invest their energies into meaningful, morale boosting projects. Creating gifts and goods for disadvantaged people that need that extra bit of a hand. Especially when times are tough and a bit of care goes a long way over Winter, Easter and Christmas periods. These programs are ideal for all business and corporate teams to be engaged 100%. Inspired others by ‘Walking the talk’ and “Making that difference“. Investing your team development activities in 2019 for worthwhile community projects. Clients share how they value their corporate teams and businesses assisting local charity groups directly. With everyone benefiting from rewarding results. Worthwhile, intelligent team building. It is a real win-win. Staff and employees experience first hand, the charities needs. 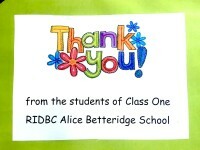 This thank you card was made by the Kids and teachers at RIDBC. Lovely to recognise the efforts made. Investing in the children, centers and programs. The team building components of handles real tools of change. With the teams positive energies, skills and focus being directed into building bikes, green machines, furniture and toys for the kids. All to an exceptional standard. Participants are able to witness their tangible contribution, supporting and helping directly. 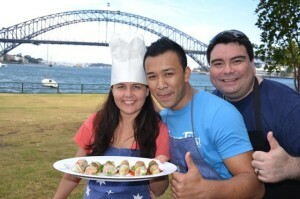 Last week we had teh customer experience cook over 100 meals for the homeless in a cooking charity event. Providing corporate experiences with engagement is a challenge we are familiar with. Furthermore, we succeed, in providing businesses with the Thrill wow factor. For both your partner charity and their clients. Put us to the test. Utilise our problem solving skills. 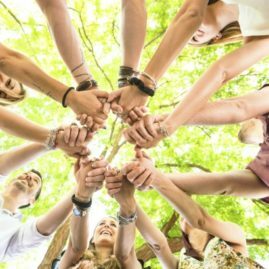 Developing your next philanthropic teamwork activity. Providing more, than a feel good experience. As we have grown up, so to has our range of services. Building Toys for Kids and disadvantaged children is one of the most memorable and touching of corporate charity team events. Assembling educational toys under supervised instruction with wonderful Cubby Houses, Billy Carts, Go Karts, Dolls Houses, Work Benches and kids master chef Kitchenettes. Which are all warmly embraced and received by the children. Recently at Westmead Hospital, we refurbished the patient waiting areas with kids learning toys assembled by Rookwood staff. Unitron and Medtronic both engaged Thrill. Facilitating great teamwork. With proceeds being directed to RIDBC. We ensure a smooth transition for the kids to comfortably receive their gifts. Built by your staff with care. Cooking for homeless, people with special needs, the elderly or disadvantaged is a lesson in life. Your Teams will cook delicious fresh produce to provide high protein nutritious and delicious meals. Termed ‘Cooking by Corporates for Worthwhile Causes’. We can create exclusive shared dining experiences. Full of flair, creativity and friendly competitions. The food can be served directly to the Charity organisation or packaged ready for delivery to OzHarvest, 2nd Bite, Hope Hostel in Sydney, Homeless Hub or in conjunction with Mission Australia. Teamwork and hygiene is required as all teams cook for a common cause. Thrill team events provide the mobile kitchens. Or invites you into restaurants, industrial kitchens, hotels or in your offices and selected conference venues. Learn excellent Cooking skills. Healthy menu planning and high protein recipes. Hosted friendly team building cooking competitions in a Master Chef or in a My Kitchen Rules style experience is our speciality. 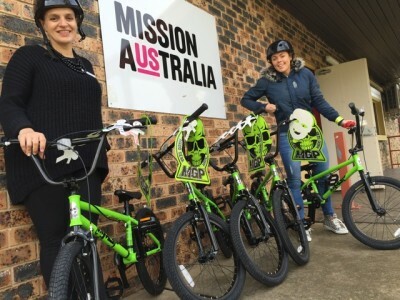 Build-a-Bike Charity Team Building Donation to Mission Australia, Sydney greater west area, NSW. With over 1,000,000 cyclists in Australia the cycling trend is ever increasing. Give disadvantaged kids a chance to ride quality built balance or BMX stunt bikes they will be proud of at the bike or skate park. 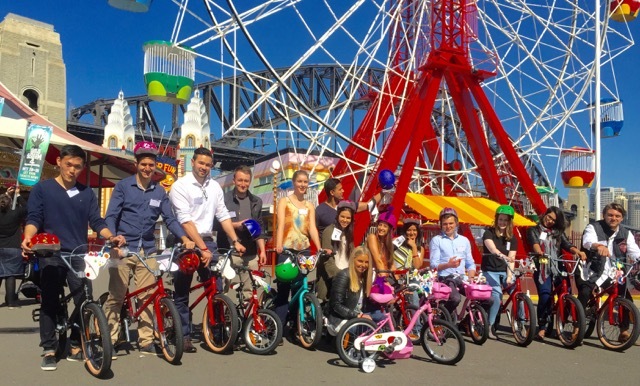 Thrill director Konrad Lippmann had the privilege of hosting 10,000+ cyclists and families on the Bicycle NSW The 2015, 2016, 2017 Spring Cycles rides across Sydney Harbour Bridge to Sydney Olympic Park. Thrill also teams up with BNSW on the Gear Up Girl Challenge from Sydney Olympic Park to Cronulla. Come on ladies give cycling a go and share the road with the MAMILS. Looking to get more children cycling to school. We build bikes for charity of excellent quality that meets Australian standards and is checked, inspected and passed thoroughly by a skilled bike mechanic. Thrill bikes are suitable quality for BMX stunts and skate park action for kids 7-15 years. Call Thrill and watch the faces of children with a disadvantage in local communities light up with a smile this Xmas. A great recognition of the teamwork that businesses can be achieved. To Get on ya Bike enquire 4 Charity Team Building Bikes for Children’s Charities. 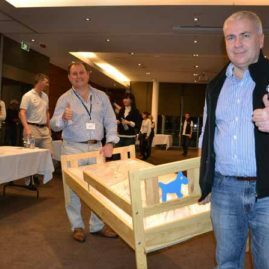 Medtronic getting into the Furniture 4 Families Team Building at Coogee Crowne Plaza for the Smith Family In Wollongong near the Novotel Hotel. Some companies call this a Flat Packed Frenzy. However at Thrill we take a calmer approach to providing corporate challenges for employees, business groups. 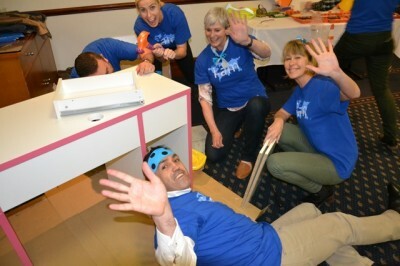 Charity Team Building quality furniture for Families with care. Ensuring each piece is assembled correctly. In order to provide quality long lasting worthwhile results. Where the families who appropriately receive the furniture. Are able to appreciate the care and love the attention to detail. Avoid smashing out the fastest flat packed furniture. Build the best teamwork Charity Team Building projects that you can with a dedicated skilled tradie. Giving you tips, techniques and quality tools to get the job done right 1st time. Special Hampers donated to OzHarvest as part of Corporate Christmas Team Building Activities. Sometimes life gets overwhelmed by the unexpected. We get your teams packing – packaging the essential ingredients for survival for the homeless and disadvantaged out on the streets of Sydney, Gold Coast, Campbelltown, Mt Druitt, Parramatta, Melbourne and Newcastle. Extras include the niceties and luxuries that make people feel special. Filling up and spreading the love. It is a fundamental and easy way to incorporate an activity for teams to make a positive impact to local disadvantaged communities. Baskets and boxes of non perishables are packed by your helping hands. 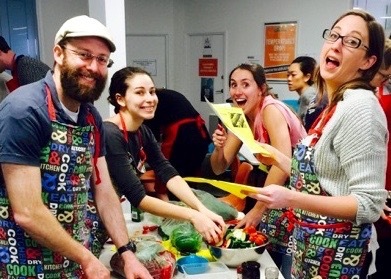 Working in with Ozharvest, Second Bite, Mission Australia and the Salvation Army. Your team collects a significant Hamper selection. You get to personalise the contents and wrap it all up ready to be distributed and gifted to people that need your assistance. 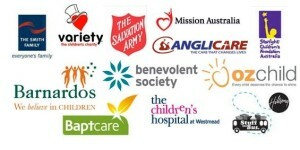 Helping Hampers make a difference in Sydney, Melbourne, The Gold Coast and Brisbane. Imagine the surprise and happiness that you can help us deliver to those less fortunate. Giving Australian Native Wildlife a helping hand by building Nesting Boxes for creatures cute and furry. Building animal shelters with your corporate team is a brilliant way to connect business teams. 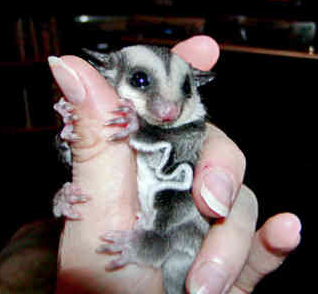 Providing Australian habitat for native animals, possums, birds, lizards, to escape predators such as feral foxs, dogs and cats. Having their own home in our suburbia and at animal rescue shelters. Is a unique and heart warming experience. The best part is that teams learn more about our Australian native animals. This is an ideal program to improve the connection of people to wildlife corridors in urban areas and surrounding your corporate offices. We conduct Animal Shelter Rescue team building activities in offices, Zoos, wildlife refuges, local council areas and with the help of WIRES. This team development experience is available when conferencing with Thrill at Taronga Zoo, Featherdale Wildlife Park, Symbio and Wildlife World in the Sydney area. Further afield to the Hunter Valley Zoo and Australian Reptile Park or Walk About Park 1hr north of Sydney. Out West we work in with Dubbo Plains Zoo or on the South Coast at Nowra, Batemans Bay and Mogo Zoos. 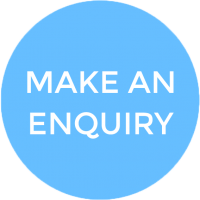 Alternatively we come to your office and conference venues to share our knowledge, experience and talents to improve your teams interaction, problem solving skills – whilst investing your activity funds into worthwhile tangible results. Building the right sized shelters for native animals is genuinely heartwarming and makes a difference to Urban areas and Sydney Wildlife Corridors. Helping Hands Team Building Exercise helps people impacted by land mines whilst being physically and emotionally healing. Thrill worked with Optiver (Optiver is a multinational proprietary securities trading firm, which focuses on market making activities and positional trading) in assembling more prosthetic hands to help others. In many countries children come in contact with live mines exploding whilst playing. The result is devastating. Of those that survive. They are faced with the reality of losing the precious ability of holding an object in their hands. The loss of confidence, inadequacy and a strong shame with humility isolates injured people. Helping Hands by Thrill team builders is a wonderful facilitated team building exercise. Your contribution does make a significant difference. With hands-on experiential activities where you are literally building a prosthetic hand for people who have lost theirs. Your staff engage by witnessing a high impact multi-media presentation revealing the lives and the real positive difference. Staff can make by using their teamwork, training and staff development to achieve improved communication and interaction. Invest in one of the most touching, personalised corporate events and team building activities that makes a genuine improvement in the life of others. Helping out the homeless with real survival equipment and assistance that makes them independent, recognised and valued as a citizen. Participate in a cooking experience where your staff believe they are cooking for their own teams. During the Master Chef cook off it is announced that all the foods will be donated to a local homeless assistance agency like the Mathew Talbot Hostel. “feels great to give back and make a difference”. New out of the Thrill Charity Team Building Activities Garage is: Green Machine Trike Building for kids with a disability or disadvantage. 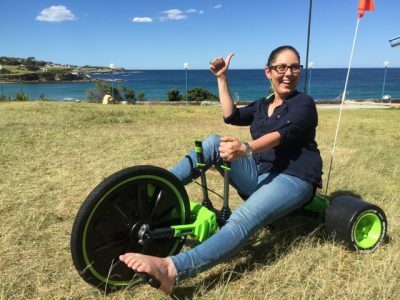 The Green machine is a 3 wheeled trike unlike any other – steering is achieved through 2 forward levers that angle the rear axle to steer or slide the green machine around corners. Why is this unique? The rider is in or almost out of control. It is a macro skill that a child with a disability can be in a safe seated position self sufficient or with the aid of friends will be able to propel themselves. More suitable than a Tyke on a Bike. Remember pedalling your go kart or having some-one, anyone, please push my billy kart? I certainly do. Although I couldn’t remember the volunteers that shoved me at an incredible pace down the street. These days it would be on a flat safe enclosed yard of course!!! BTW did you know that some Japanese child care centers have no fences. Even encouraging risk taking behaviours. Why? Because they believe a child should learn through their actions. I’m still learning through mine – what about you? Back to the game plan. You get to build Billy Karts and Race them. Yep. So much fun, being a big kid. Much better than building a Cardboard Race Car – these fun kids buggies are donated rather than go to waste. But if that’s what a client wants. 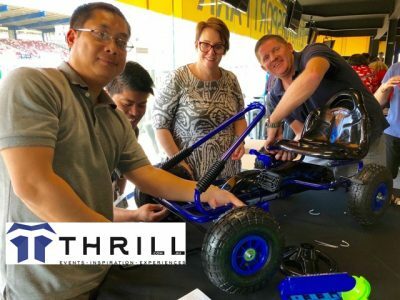 Thrill will put Teamwork to the test and have your leadership, sales or business team building and racing a life-size F1 racing car flat out: We define Formula One Teams construct, then play and race life size F1 racing cars. Please make a difference and invest in worthwhile charity team building activities for your next team away, Christmas celebration, 2020 Vision Kick off or your next team off-site conference day. Contact Thrill corporate events team for further details incorporating your business values, brand, culture and linking to suitable charity groups throughout Australia.